Multiple sclerosis (MS) is the most common demyelinating disease of the central nervous system. 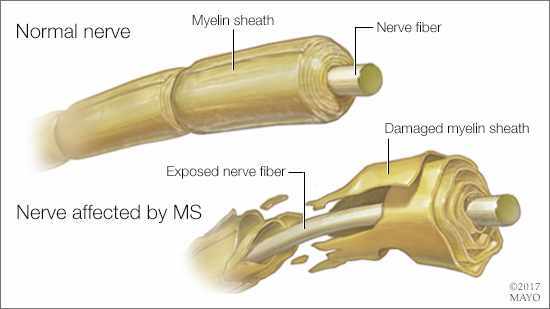 With MS, the immune system attacks the protective myelin sheath that covers nerve fibers and causes communication problems between your brain and the rest of your body. It is an incurable, potentially disabling disease, and the cause is unknown. There is no evidence that a specific diet can prevent, treat or cure MS. Some special diets can be harmful because they contain too much of certain vitamins or not enough of others. Learn more from Dr. Orhun Kantarci, a Mayo Clinic neurologist. Antibiotics and alcohol can cause similar side effects, such as stomach upset, dizziness and drowsiness. Combining antibiotics and alcohol can increase these side effects. In some combinations, more serious reactions such as headache; nausea and vomiting; rapid heart rate; and a dangerous increase in blood pressure may result. Learn more from Dr. James Steckelberg, a Mayo Clinic infectious diseases expert. Alli is an over-the-counter drug meant for overweight adults struggling to shed excess pounds. With its easy access and weight-loss promises, is Alli your answer for losing weight? Here's what you need to know. Tapeworm infection is caused by ingesting food or water contaminated with tapeworm eggs or larvae. Some people with tapeworm infections never need treatment, for the tapeworm exits the body on its own. Others don't realize they have it because they have no symptoms. However, if you're diagnosed with an intestinal or invasive tapeworm infection, one or more medications may be prescribed as treatment. Learn more about the diagnosis and treatment of tapeworm infection. It can be difficult to tell the difference between the ups and downs that are just part of being a teenager and teen depression. The latter is a serious mental health problem that causes a persistent feeling of sadness and loss of interest in activities. Depression symptoms likely won't get better on their own — and they may get worse or lead to other problems if untreated. Depressed teenagers may be at risk of suicide, even if signs and symptoms don't appear to be severe. Learn more about the emotional and behavioral changes that may signal depression in your teen and when it's time to seek medical care.